It’s that time of your life and you want nothing but the best look for yourself! A farewell party is not just high on emotion, but also high voltage when it comes to maximizing the look in every possible way. Girls prefer to experiment with a look that is completely diverse from their usual fun-western kind, sported by them otherwise. And the most common choice of course is the saree! The gorgeous saree on one hand might be the most desired dress for the day, but when it comes to its real wearing, a barrage of questions will cloud the mind filling it with doubts. Questions like-will I be able to carry it through the day? Will the saree suit my body type? What if I want to dance? 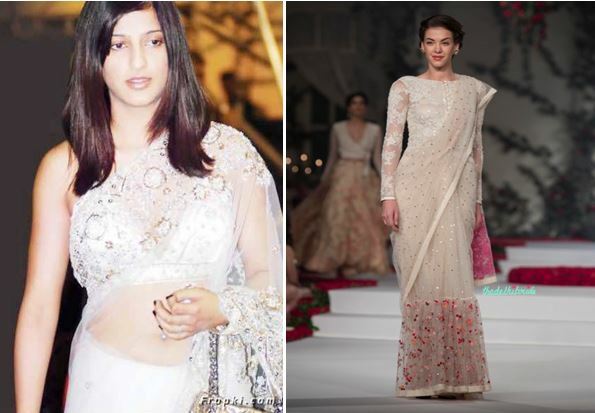 Should it be a completely traditional saree or the more modern chic variety? These doubts are not unfounded. Here are some questions that you need to have answers for, before you begin selecting your saree. Are you an average height, short or overly tall? How good are you with wearing heels? Have you ever worn a saree for long hours? 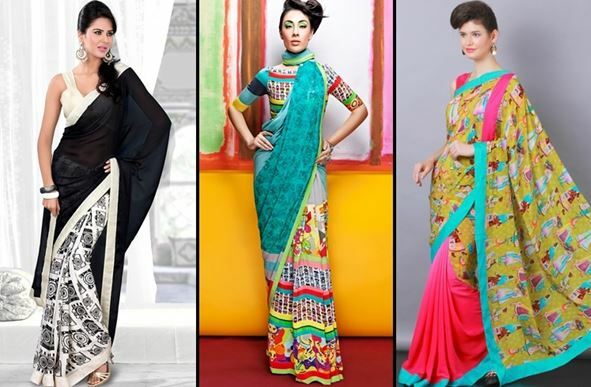 Are you comfortable wearing a traditional saree that requires accessorizing? Once these mandatory answers are with you-we could begin with some suggestions for the most desired sarees for the farewell season. Considering that you are going to be attending the formal and informal parts of the farewell in the institution, with just enough time to powder your nose in between, remember to choose a lightweight saree that could be traditional as well. I would strongly recommend Chanderis, Maheshwaris and Banarasi georgettes, as they have a steeped in tradition look while at the same time are supremely lightweight. Here are some great reasons for opting for Chanderis-they are lightweight, have the sizzle of gold zari for the tradition–fix, make you look young and feminine, and can be easily accessorized with gold danglers. Classy and understated for those who want to stun with their looks! Another way to make a huge impact would be going the floral natural way. Wear soft pastel prints on crepes and georgettes that will highlight your youth. Stylize with not very chunky jewelry and let the colour play out its magic. This look would be perfect for those who are on the plumper side and could do with some height as well. Remember that you do not have to wear a saree that Mom wears!! You must assess your own body type for the choice of saree. 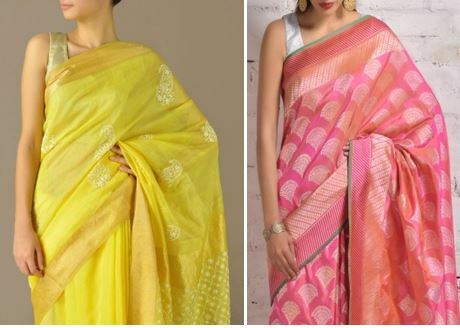 While I love the look of these sarees, and they certainly have been creating quite a stir on the catwalk all of last season, you must also take into consideration that sarees made of net and fragile fabrics have to be handled with great caution. Your blouse and petticoat have to be as perfect as the outer wear. They make you look like a diva no doubt, but will also not allow you to let your hair down when the party gets wilder. So choose wisely. Because of the very fact that the saree is almost see through, the blouse must be befitting the occasion –wear something that decently covers you up-preferably with long sleeves and with a high neck. Sheers are also recommended for those who have a great figure, so watch out on that front. Sure pastels make you look young, but if you want to go completely high on accessories and wish to highlight your blouse as much, wearing a solid colour would be recommended. And colors you could wear are galore-deep greens, bright oranges, magenta, bright turquoise blue-each of them can suit a particular skin type and complexion. See how well you can find a blouse that looks as ravishing. Remember if your blouse is heavily embellished go easy on the jewelry. If you have worn a thread work choli, team it with satin tasseled earrings. Wear striking contrasting color and be that vivacious beauty you always have wanted to be! Great choice- and why not? The pleasure of having two completely different textures, designs, colors and styles blended in can be carried off most interestingly at the farewell. Go for the Bohemian chic style with handmade jewelry, kolhapuris and an ethnic wristlet to complete the look. If the saree is heavily embellished then it takes away from your youthfulness-so opt for half and half sarees that are simple, come in more contemporary prints rather than with zari and gota. That would add too much age to your look. Tips on Getting The Look Right! Go easy on heels-yes-it’s the number one enemy to look out for when you are on a long haul party like the farewell. It’s also advised that you go for block heels rather than platforms as your walk does get a little sloppy with platforms and when you are draped in a saree you would do best to be either in flat-like jutis or on heels like block variety. Teetering stilettos might look the best as long as you can sustain yourself for six hours on them. Overdoing the accessories-Go easy on heavy jewelry as it does tend to add age to your look and while you maybe be passing out there a is still time for your wedding and such heavy jewelry is best left for that day. Go for simple jhumkas, and for the more ethnic look there are so jewelry choices that are flooding the market. Try to blend in silver with the more handloom look and golden with zari work sarees, while the chiffons and stone work will look best with crystal and stones. Do not carry a clutch -yes-for day long events carry a smart purse that is not overlarge and can dangle from your wrist and can carry all your essentials. Wear a Blouse that is in keeping with the occasion and don’t do the halter neck or spaghetti top if seniors are there. Make sure that your makeup is more natural and not over done with too bright a lipstick or eye shadow. Rely more on kohl pencils and smooth natural shades of lip smears. Caked up layers of foundation can give you a frightful look when the sweat gets rolling. Make sure that you do wear the saree with the footwear on as a rehearsal and also with some makeup-then, go ahead and click a few pictures to see how great you look! There is no harm in a bit of revision!